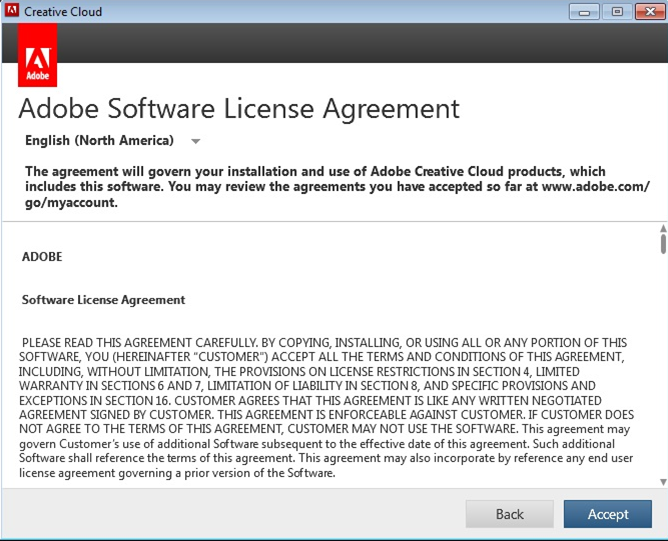 A Creative Cloud application doesn't launch and you're unable to proceed on the End-User License Agreement (EULA) dialog box. Some users face an issue where the EULA dialog box on product launch isn't dismissed even after they click Accept on the license agreement dialog box. The product does not launch and the user is stuck on the EULA dialog box. Click the "x" button in the upper-right corner to close the EULA dialog box. Download and install the latest version of AAM (Adobe Application Manager). Now launch the product. The EULA dialog box appears. Clicking Accept dismisses the dialog box. Close the EULA by clicking the "x" button in the upper-right corner. Browse to the following location and delete the _LicenseAgreement.xml file. Launch the product. The EULA dialog box appears. Clicking Accept dismisses the dialog box.